Stocks trended down this week as the S&P 500 closed roughly 1% down. On Thursday, when the S&P 500 fell for a fourth consecutive session, it marked it s worst string of losses in 2018. S till, the S&P 500 is up for the year and has rebounded well since the early February drawdown. Additionally, US Companies reported strong fourth-quarter earnings, with approximately 75% of companies reporting per share and revenue above analyst expectations. Pair that with the fact that the percentage of S&P 500 companies beating earnings estimates is the highest it has been in more than six years. Why hasn’t the market reacted positively? It could be because investor optimism may already be priced into stocks in anticipation of the earnings reports in late December thru early March. Everyone knows the adage for investing: to succeed one must buy low and sell high. Easier said than done. In fact, there are many studies that show it’s impossible to consistently time the market – and even more challenging to take into consideration potential calamitous black swan events , such as September 11 th , the 2008 financial crisis and Brexit. Still interested in attempting to time the market, or better yet – hiring an advisor who claims it is possible? Don’t buy it. 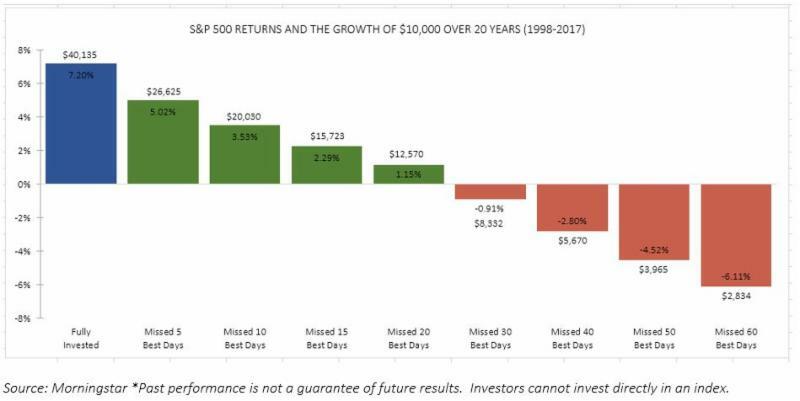 By barely mistiming the market, you can lose out on significant returns. To illustrate this point, consider the S&P 500 ® and the growth of $10,000 over 20 years. If we evaluate the time period of 1998 – 2017, that $10,000 would have grown to approximately $40,135. But, if you miss just the five best days of that 20-year period, the growth of that money is reduced to $26,625 - over $13,000 less. If you miss the 20 best days of that 20-year period, that $10,000 only grows to $15,723. The worst days are just as hard to predict. There are many additional studies showing that investors actually buy high and sell low, negatively impacting their performance. Morningstar’s Investor Return calculates how a typical investor fares when responsible for buying and selling vs. a buy and hold approach. 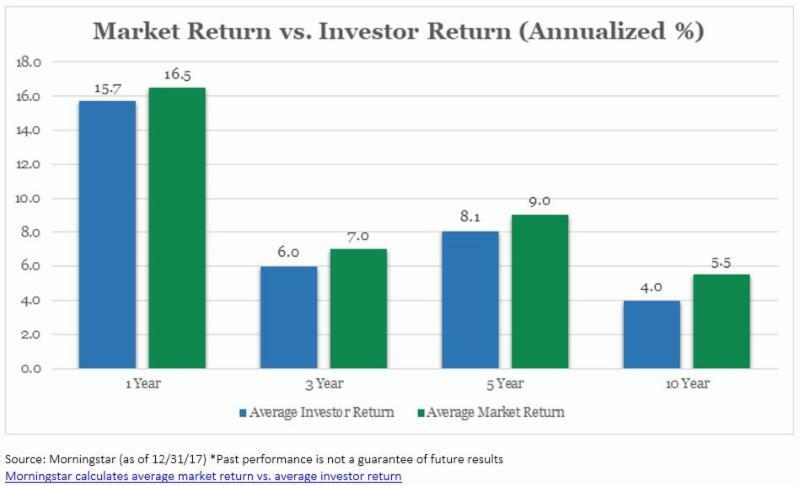 If you look at the 10-year data below, you are able to see that the average investor reaped a return of 4% annually (weighted by actual open-end fund asset levels as of 12/31/2017) whereas all investments together returned 5.5% annually. Creating an asset allocation that fits with your risk tolerance and time horizons, and sticking to it, may help to avoid the pitfalls of market timing and the lost returns that often accompany it. While an additional 1.5% annually may not seem like much in a given year, it’s incredibly significant over an investor’s lifetime. Recent research shows that workplace cultures that encourage employees to answer emails quickly have more stressed and less productive employees overall. Additionally, the reactive nature of these cultures cause employees to think less strategically. If you find yourself constantly checking and responding to emails, there are a few quick tips. First, a strategy of switching off your email alerts yet staying disciplined to checking emails only once every 45 minutes or an hour can help reduce stress and feel more in control. Second, if you do send emails after hours, send them with a delay feature to come the next morning so you don’t build stress on others. These are helpful tips considering on average employee in the workplace checks their emails 11 times per hour, each time resulting in a 64 second interruption after reading and responding.